Last year I was driving this block as I often do on my way downtown, when I decided I should check the City's property database to check the status of the three houses below. I had recently seen two of them advertised for sale in the Post. Much to my dismay, I found that all three had demolition permits applied for them. They had all recently purchased by Saaman Corporation, a local developer that has been one of the more prolific builders at the nearby Gaslight Square development. 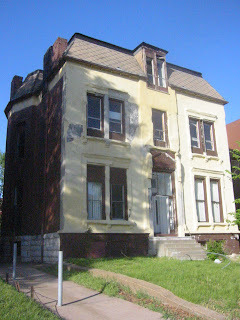 Prior to starting my own blog, I alerted Steve Patterson of the situation, and with some photos I sent him, he did an extensive post on Urban Review STL last April. Clicking on any of the photos in the post will send you to Steve's Flickr page where about a dozen additional photos of the homes may be seen. Shortly after, fellow blogger Doug Duckworth met with 18th Ward Alderman Terry Kennedy. Kennedy was apparently unaware of the proposed demolitions, and expressed some a desire to have them renovated instead of demolished. 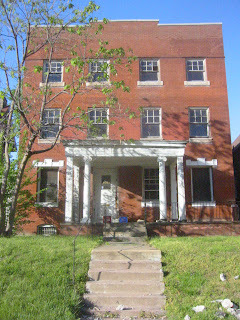 In early May 06, Doug reported that Kennedy had halted the demolitions. Recently however, Kennedy has not responded to emails about the houses from Doug. See his accounts here. What ultimately happens to these three homes remains to be seen. This block as many of you may be aware is just a block north and east of the highly successful Gaslight Square development on Olive (this will be the subject of a future post), and the block of Washington west of Sarah is currently seeing new construction and multiple renovations. These massive homes built between 1883 and 1900 and with square footage's of 3,196, 4,770 & 4,837 could be a showcase renovation project. Being this large, the homes would probably need to sell $6-700,000's to cover the costs of renovation. While this is likely too high for this block at this time, it would be more feasible to split the homes into two or three condos each and sell them in the $300,000's, which is very comparable to Gaslight Square. This is the same concept that was done at Maryland Place with the old homes on Maryland Avenue. To add additional revenue as well as density into the project, smaller carriage house units could be added over new garage structures at the rear of the property. This was successfully done in a development called Laguna Court in Santa Barbara, which also features three renovated historic homes. Maryland Place also is building carriage house units (but are smaller and will be owned by the townhome condo owners). 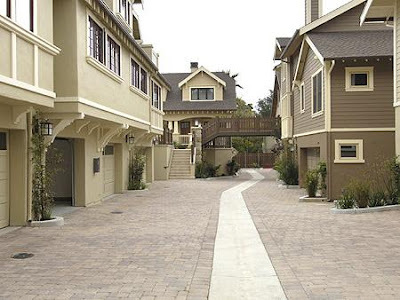 Laguna Court (photo from promotional literature), at left is the row of carriage house units at the rear of the property and at right is the rear portion of the renovated homes. Using a similar development plan on Washington could yield upwards of 12-13 units total. This is more units on the same property than could be had by demolishing the homes and building townhomes similar to Gaslight Square. Kennedy will simply allow the properties to sit as-is until he gathers enough complaints and calls for them to be razed. He is a dynasty alderman with no real challenger in the election next week so he has no pressure to take pro-active action. Perhaps we should appeal to the neighborhood associations? 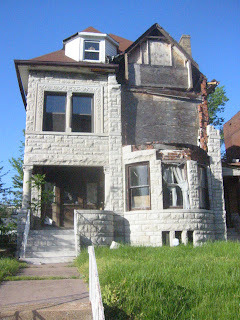 If they could be convinced that demolition is unnecessary due to vacant LRA property, perhaps Kennedy could be persuaded? Thanks for your coverage and updates on this area. In the 1990's when I worked in Mid-town I always wondered about them and noticed the outstanding detailing many of them had (and the others in previous posts), alot of them are gone now and it is a crying shame. Any updates for these houses, Paul ? News is, these are slated to be demolished soon. DAMN!